Assassin Miniatures is a German company, producing mostly female models. The sculpting on these models can vary, but most are very good. The models come with slotted metal bases. This makes rebasing to your preferred standard very easy. One thing to know about these models is that they are limited to a few hundreds of each (How many exactly depends on the model), so if you see something you like, it is best not to wait too long. 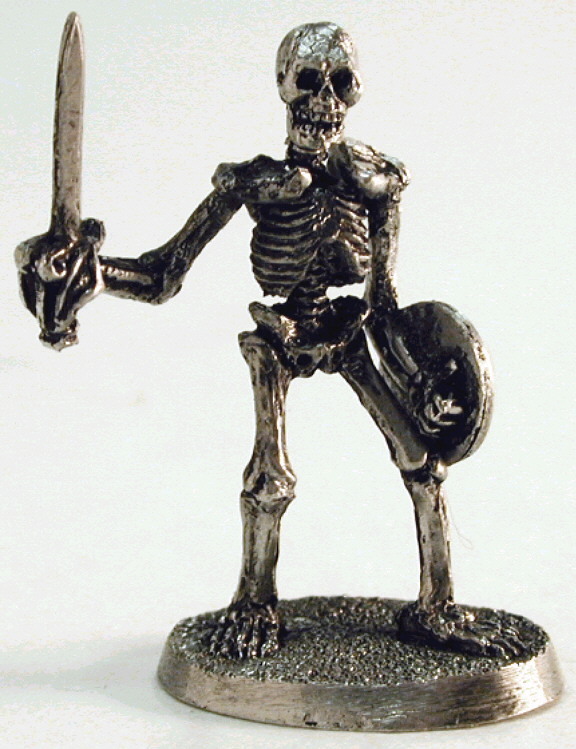 They produce a couple of undead miniatures, but only one skeleton so far: the Undead Lord . Incidentally, this one has neither slotted base or production limitation. 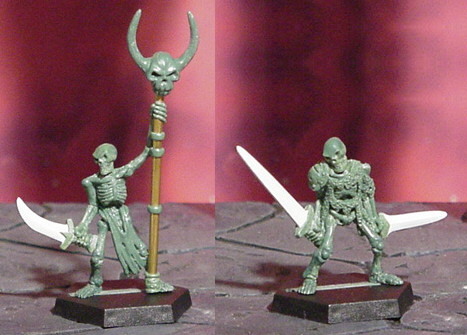 Fortress makes some decent enough skeletal miniatures. Not the stuff nightmares are made from, but good for rank & file. 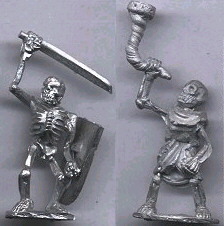 They have a skeletal standard bearer and musician, skeleton with spear and skeletons with hand weapons. They are the publishers of fine games under the imprints Crunchy Frog Enterprises and Nightshift Games, with lots of fun and crazy miniatures. The range to look for is "Vampire Hunter$". The models have solid bases, so rebasing will be necessary. Aside from some great look-a-likes for such personalities as Buffy, Lara Croft or even Ash (Evil Dead) they also have skeletons. Well, actually they have ONE skeleton so far. What it looks like? Well... His name is Eddie and he's a skeletal rocker. 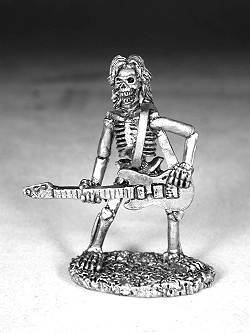 What to make of a skeleton with an electric guitar, you ask? Well, I'm sure you'll think of something. Amazon has a bit of everything and that includes undead. The sculpting is not as good as on some (most) of the other companies we've listed, so my advice is to look first and buy later. List of sculptors for this company includes Sandry Garrity of Reaper fame (among others). Ranges to look for: "Fantasy" and "Warchest". One word of warning though, I have not seen these in the flesh yet, so I don't know how they compare sizewise. 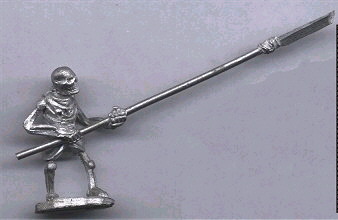 The Fantasy range has many useful (skeletal) bits and pieces to decorate your terrain and bases: Impaled Victim, Tripod of Skulls, Skulls on Spikes, Bone Pile, Wall of Skulls. 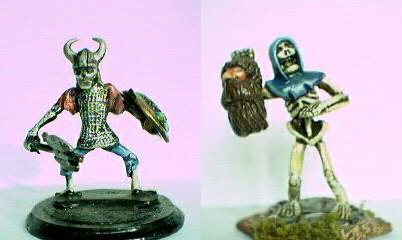 The "Warchest" range has an undead warrior (21604) and undead hero (21607). Solid bases, rebasing will be required. Ranges to look for: "Alternative 28mm fantasy". If you want something completely different, go to the Undead Army section and look for "Undead of the Witchlands", being 19th century Russian militia/cossack skeletons. If you've come here looking for the best sculpting, chances are you'll be disappointed. While there is the occasional gem to be found if you search (very) thoroughly (like the flashing dwarf for instance), most miniatures are below the modern day wargamer's standards. Prices are affordable and they certainly have some original stuff. They have some rank & file skeletons, with hand weapons, bows, pole-arms,... They also make a chariot and a bolt thrower. In the "Undead of the Witchlands" section you'll find Russian/Moskovan/Krautian skeletons with guns, including a Russian skeletal dwarf in military uniform. Nuts. This company produced some modified old Heartbreaker models as well as completely new ones. It's been silent around them lately, so maybe they're out of business? These models come/came with plastic slotted bases. The painted models are ex-Heartbreaker figs. 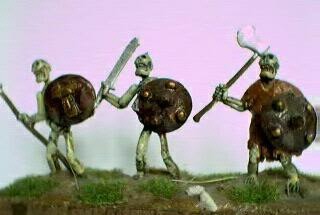 This company produces 10mm, 15mm, 20mm and 25mm historical and fantasy miniatures. Range to look for : 25mm Dragon Fantasy. The miniatures come with solid bases and though the sculpting on the skeletons is not the best, they can still be used as rank & file. You'll have to supply your own bases. 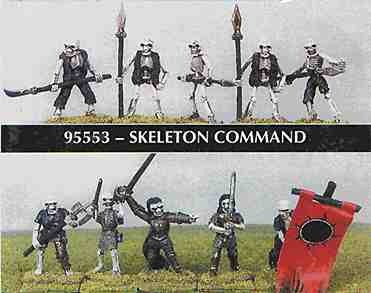 They have rank & file skeletons and command figures. 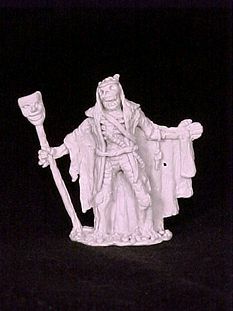 I know very little of this company except that it is based in Australia and produces miniatures for most of the common fantasy races, including undead. Available models : Skeletons. 'nough said. Downside : They're very hard to come by unless you live in Australia. They have solid bases, so you'll have to rebase them. Not overflowing with detail and that's probably an understatement. The dead walk . . . and they're coming for you! Sculpted by the renowned Richard Kerr, Skeletons Miniatures" gives you eight classic figures, with the heads and arms separate. Strange enough, these multi-pose models come with solid metal bases attached to them... Rebasing required. Mix and match for the ultimate in variety, and create the skeleton army you want! Arms include everything from knives and swords to deadly modern-day hardware, and extras are provided.